A Primer or a Refresher? I have not always been a “reader”. Most of my reading over the years has been to my children and grandchildren. It is only in the last several years that I acquired any taste for books. And my tastes in reading material vary widely. But several years ago, I had a book suggested to me by a fellow leadership coach. He recommended the book Emotional Intelligence 2.0 by Travis Bradberry and Jean Greaves. Immediately I started using this book with many of my leadership coaching clients and I think it is worthy to provide a primer to the uninitiated or a refresher with the broader Leadership Voices audience. The book has a foreword by Patrick Lencioni. Many of you will recognize him as the author of Five Dysfunctions of a Team and Death by Meeting. If you are into great titles, those are a couple of great ones. As Lencioni proclaims in the foreword, he’s no expert in this field, but he sees everyday how critical a skill it is to have and he’s so enthusiastic about this book because it’s the first he’s read that actually shows you how to increase your EQ and apply it in your personal and professional life. 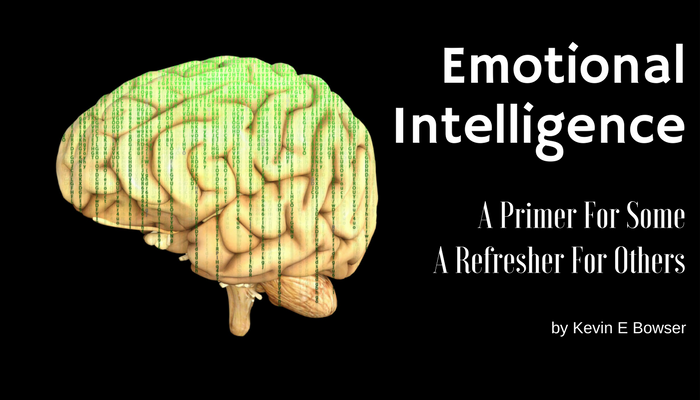 The opening chapter deals with Emotional Intelligence (EI) and your Emotional Quotient (EQ) and compares and contrasts it with the more well-known IQ. The chapter describes what EQ is and what it isn’t. For example, a lot of people mistakenly think that EQ is a part of your personality. To the contrary, EQ is separate from your personality, just as it is separate from your intellect, or IQ. It begins to build your understanding of emotions by showing what the five core emotions look like in varying degrees of intensity. Next, the team of Bradberry and Greaves explain research studies that illustrate how important EQ is in daily living. They show how your EQ impacts things like your tolerance for change, how you manage stress, and even how much money you make. The book introduces and explains Daniel Goleman’s four EQ skills: Self-Awareness, Self-Management, Social Awareness, and Relationship Management. Beyond a conceptual description of the skills, the book provides detailed vignettes showing examples of real people who are high or low in each of the skills. To truly improve your ability in the four emotional intelligence skills, you need to better understand each skill and what it looks like in action. What is a “CAO?” That would be a “Chief Accountability Officer.” And you probably won’t find one in the C-suite of your organization. But there probably ought to be one. In fact, accountability is one of the key functions of a leader when the leader has other leaders who report to them from an administrative perspective. For those of you who are lovers of history, you will know or remember that President Harry S Truman had a sign on his Oval Office desk that read: “The Buck Stops Here.” It meant that he accepted responsibility and that he was accountable for all the decisions of his administration. He accepted them for his entire administration. President Truman’s stand still exists in a few organizations today but, unfortunately, it is the exception rather than the rule. But my point today is not about accepting personal responsibility. The point I want to make today is that if YOU are a leader, you have a responsibility to hold those around you accountable for their actions or inactions. I am fairly sure that President Truman didn’t let his Cabinet and the rest of his administration run wild and then accept the responsibility and any blame for their actions. That would not be good leadership. He realized that he was ultimately accountable. But, I am sure that he worked with his Cabinet Secretaries and the rest of his administration and that he had expectations of his administration. 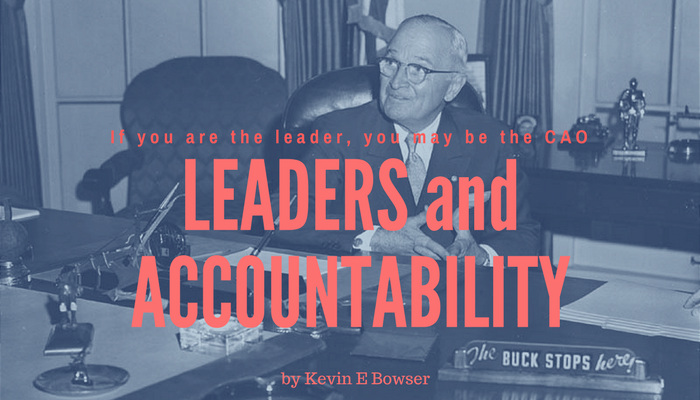 What is my role as a leader when it comes to accountability of those who I lead? First of all, accountability for your team does not happen in a vacuum. There are many factors that must be present in order for accountability to be the norm rather than the exception. One of my favorite individuals to listen to on the radio when I am driving around is a conservative talk radio host by the name of Dennis Prager. Even if you do not agree with his political persuasion, you have to respect his emphasis on, and value of, clarity over agreement. This resonates more and more with me the older that I get. There was a time when an argument must lead to agreement, surrender, or acquiescence by my opponent. These days, I am much more willing to accept the possibility of disagreeing agreeably. I just need to ensure that there is clarity and that I am both understanding others and being understood. 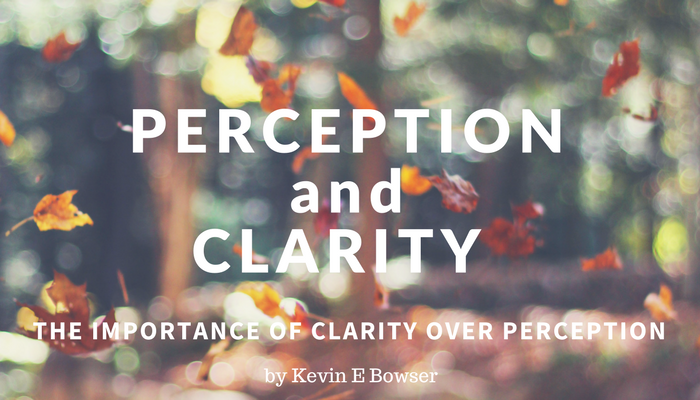 All of that aside, I really would like to deal with the issue of clarity and perception. 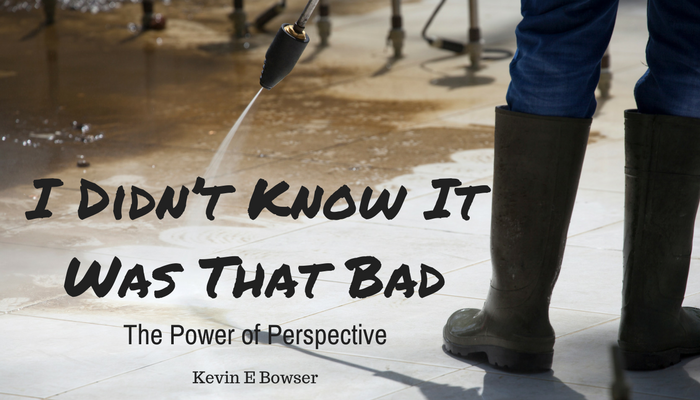 Specifically, it is important to have clarity around our self-perception when we are leaders. How many of you remember growing up and playing on the playground? 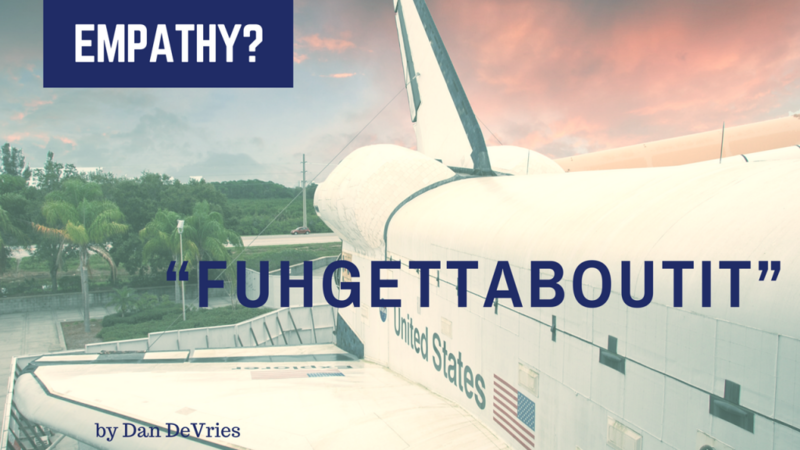 What did you say when someone said something mean or hurtful to you? Maybe you said what many children have said when you repeated a little saying. Oh, how I wish that were true. 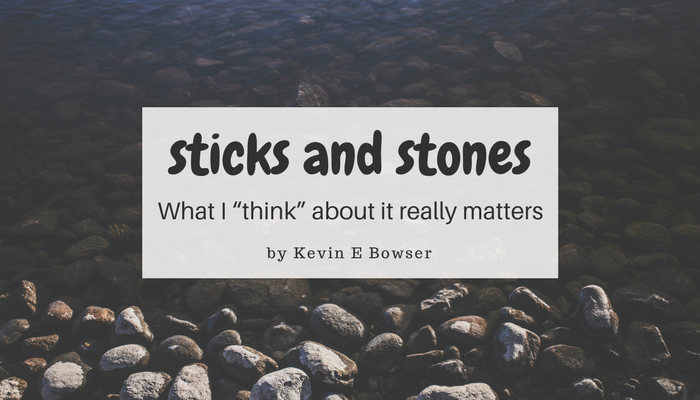 As we have gotten older, we have realized that words hurt more than the sticks and the stones. In fact, I heard a person say one time that “it is not what you think about me or even say about me that hurts me. It is what I think about what you think about me or say about me that hurts me.” What they are saying is that it is my perception about something that drives my behaviors. I am working on some “appendix material” for my upcoming book. And I am working on a leadership development resource for 1-on-1 mentoring. I am working on the issue of self-awareness or self-perception. My focus for that section is on how we perceive ourselves, how others perceive us, and how we perceive that others perceive us. This can almost become a carnival house of mirrors scenario where that loop can become almost infinite. So, let’s not go that far. Psychologists often use words like self-perception, other perception, and meta-perception. They indicate that we can be good or bad at each the of perception. I love alliteration. It helps me cement a concept in my mind. So, I am modifying their words to help me get a better grip on them and their leadership implications. So, I will use Self-Perception, Social-Perception, and Circular-Perception. Self-Perception is simply a matter of how you see yourself. Our role as leadership mentors is to help our protégés to help them really see themselves as they are. And not just as they perceive themselves or even as others perceive them to be. Let’s face it. Very few of us are “black belts” at self-awareness. mentors must never come across as having become too much of an expert in this regard. 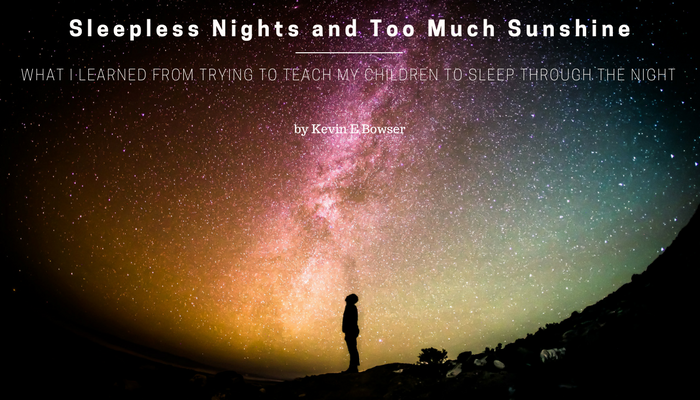 What I learned from trying to teach my children to sleep through the night. I remember when our children were very young. One woke up laughing, the other, not so much. For those of you who know my family, I will leave you to guess which child responded with laughter and which responded with tears. And I remember trying to teach them to sleep through the night. (Of course, I also remember setting up a borrowed video camera and recording our first born while he slept. Pretty exciting video, isn’t it? But we were brand new parents.) But the process of training them to sleep through the night and go back to sleep when their little bodies awoke in the middle of the night was hard. There was a huge part of me that wanted to just pick them up and bring them into our bed and snuggle. It seemed that between my wife and I, only one of us would have the strength to deal with the crying. One of us would begin to cave in and the other would be strong. Then the roles would reverse. And on it went for days and days until we finally made it through the night. What is a beleaguered parent to do? Should I scoop them up and feed them every time they cried? Should I bring them into our bed to sleep? There is a problem with that approach. They were growing bigger, and they no longer needed to eat every two to three hours, and it would ultimately hurt them and be bad for them if we allowed them to never establish a healthy sleep pattern. They needed sleep, I needed sleep. Heaven only knows that their mother needed sleep! So, what is the beleaguered leader to do? I got one of those lovely letters from the Homeowners Association that no one likes to receive. It told me that my driveway was too dirty. And it told me that I needed to clean my driveway. No, really. That is what it said. So, I borrowed a pressure washer from my son and set about the task of cleaning my driveway. What I saw after the first spray of pressurized water hit the concrete was amazing. That first jet of water took off 19 years of accumulated dirt and gunk that had settled on it over the years. That first swath of high-pressure water took off that gunk and revealed concrete as it must have looked 19 years ago when it was poured and cured. To look at the concrete the day before would never have given me the hint that it was that “dirty.” In fact, I thought the HOA folks were a little crazy. But one look at the “clean” concrete next to the areas that I had not pressure washed yet showed that the concrete had indeed become very dark gray and almost black by comparison to the newly washed section. This certainly gave me an interesting perspective on things. It made me a little self-reflective. What about my own life? Had I let it get dunked up with many years of accumulated dirt and grime? So, as a reference point, I left a little patch of concrete alone. I did not even get it wet. I wanted to leave it alone. That little dark patch on my driveway is a reminder of what the whole driveway looked like before the pressure washer hit it. What is the Leadership Lesson? We are waiting on the word “leave” from senior management that will say something like this: “Unless business reasons would make it otherwise imprudent, feel free to leave early this afternoon and begin to enjoy the July 4th holiday.” Those are the words everyone is waiting to hear. Days like today are the kinds of days that, unless you have something specific planned or are going to be out of town on vacation, it just doesn’t make sense to take the day off as a vacation today since it will be a short day anyway. 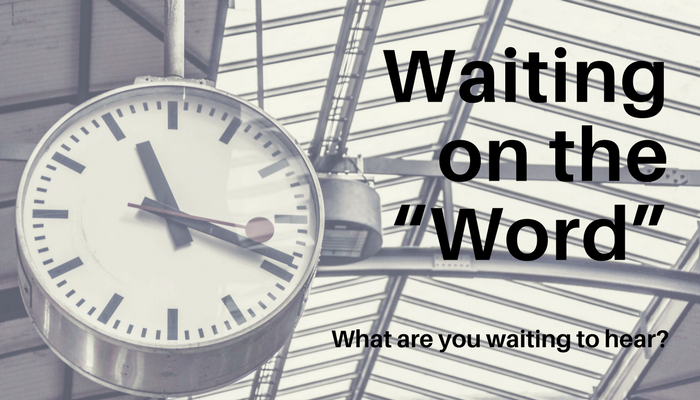 Plus, you can be really productive in the time that you are there because there are only a handful of folks here and there are very few meetings that show up on your calendar. So, it is really a good day to get stuff done and get caught up on email or other administrative tasks that have slipped to the back burner lately. Like many others, I am just waiting for the word to come from our leader and I will exit with all due haste. What is the Leadership Lesson here? 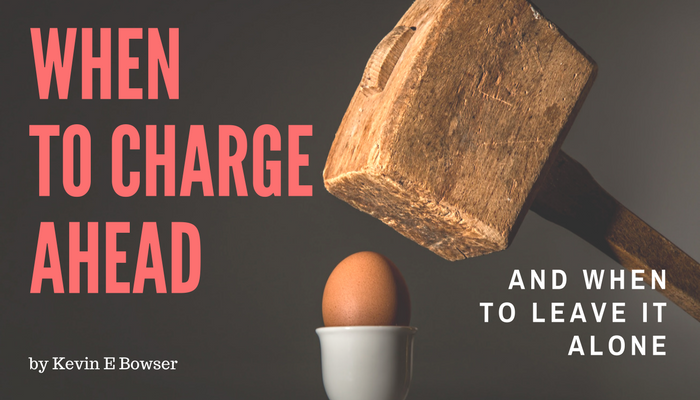 How do we determine when we are to charge ahead as leaders or leave it alone and deal with it another day? Never put off until tomorrow . . .
We have all been taught in elementary school that we should not put off until tomorrow a kindness that we can do today. But what about a tough decision that we must make as a leader? Is there ever a situation where we would want to put that off for another time down the road? When? That is the question! When is it right to charge ahead and take the bull by the horns and lead in the midst of a difficult situation? And when is it right to stand back and leave the issue alone and take a more relaxed and non-confrontational approach? These are legitimate questions that I have wrestled with in my own mind for many years. I have been guilty of rushing in too hard, too fast, or too soon. And I have been equally guilty of ignoring or turning away from a situation that had a whole lot of downside and very little upside that would drain all of my mental or emotional energy. The problem is in knowing when to charge ahead and seize the moment. And knowing when to relax and take a more measured approach to the issue that faces us. Our followers will reflect whatever you project. It is just that simple. It is also just that scary. I was suddenly mortified. What if that was true? (And I believe that it is to a large extent.) What if those little eyes really are watching my every move? Fast forward now many years later and I can tell you that my children have grown into incredible adults. They are each wonderful parents and role models for their own children now. But stay with me, please. This is not an article about parenting. It is really a quick article about leadership outside of the home. And it is about how our followers perceive us. In other words, how do they perceive the leadership message or methodology that I am projecting? 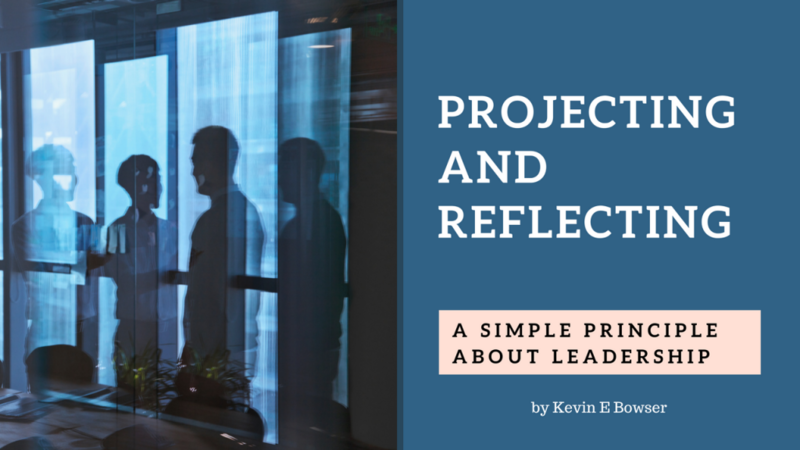 And can I tell what I am projecting by how they reflect my leadership? I have been spending a lot of time at work recently helping to implement a project that is dividing those that will be affected by it. Some are very excited about the opportunities that the project will provide, and others are concerned about negative impacts that they fear it will bring. The resistance has gotten political, and the war of words has permeated both conventional media and social media. Although I do not interact directly with those in opposition, I find myself wanting to reach out to them to correct a lot of the misinformation on which they are basing their statements and to chastise them for being so ugly in their choice of words, especially on Facebook and in website comments. Since positions on this project are so sharply divided, it is obvious that, regardless of the outcome, one side or the other is going to be disappointed, bitter, angry, and even scared. I’ve had the chance to watch the project’s leaders reach out to those who are so critical of them. Those leaders have resisted the temptation to criticize and stifle discussion. 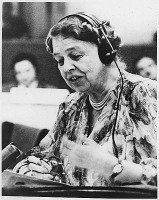 Rather they have indicated a willingness to listen and to hear the background and justification for the fears. They have acknowledged that some of the concerns are, in fact, legitimate for some, and have offered ways to mitigate those impacts. In short, they have shown Empathy. Now, Empathy does nothing to change the situation itself. The “facts of the case” remain the same. However, Empathy does speak to the heart of the individual. Being understood and having your feelings legitimized has a softening effect and even a healing component. It can be the difference between just experiencing disappointment as opposed to feeling steamrolled…discomfort instead of pain.